Tis the season for Christmas posts. For these last five days before Christmas, I’m going to try to post several posts. Probably not every day, but at least throughout the week. This post deals with two things my family and I love combined together: Christmas and movies. For at least the past 22 years, it’s a Christmas family tradition for us to watch “Rudolph The Red-Nosed Reindeer” (1964), “A Charlie Brown Christmas” (1965) and “A Garfield Christmas” (1987) on Christmas Eve or Christmas Day. 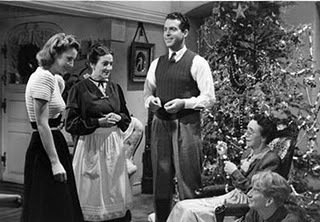 Of course we also watch classic holiday films such as “The Bishop’s Wife” (1947), “Miracle on 34th Street” (1947), “White Christmas” (1954), “Christmas in Connecticut” (1945) and “It’s A Wonderful Life” (1946); just to name a few. I always forget this is a Christmas movie and I bet you do too. Polly Parish (Ginger Rogers) is working as a sales girl in a department store during the Christmas holidays. One day she finds a baby on the steps outside an orphange and picks it up before it rolls down the stairs. No one believes that it isn’t her’s and she is forced to take it home. The store owner, J.B. Merlin (Charles Cobern) and his son David (David Niven) make sure that Polly doesn’t get rid of her baby, all during the Christmas season. To review: I love movies with babies and this is a very funny movie. My favorite part is when Rogers and Niven go out to celebrate the New Year. •Beyond Christmas (original title: Beyond Tomorrow) (1940): Last year, I had my mother tape this movie and we randomly watched it in the middle of the summer. This is one of my favorite Christmas movies. The movie stars Harry Carry, C. Aubrey Smith and Charles Winninger as three old bachelors who live together. Every Christmas they drink their Tom and Jerry’s and do nothing more. But this year, the men decided to invite strangers off the street for Christmas dinner. The strangers (Jean Parker and Richard Carlson) eventually fall in love. The three old men die shortly after Christmas in a plane accident, but their ghosts help bring the couple together and work through rough times. To review: It’s a really heartwarming, cute film. The whole thing might not take place during Christmas, but it reflects the spirit of Christmas. •It Happened on 5th Avenue (1947): I only just saw this movie last Christmas and think it is really charming. McKeever the hobo (Victor Moore) lives in wealthy folks mansions when he knows they are away in another home. He invites recently evicted Jim Bullock (Don DeFore) and Bullock’s homeless army buddies to stay in millionaire Jim O’Connors (Charles Ruggles) mansion for the Christmas season. O’Connor and his daughter and ex-wife (Gail Storm and Ann Harding) come back to their mansion after family problems and live amongst the homeless folks, never telling them their real identity. To review: Its a really cute movie and also rather funny. 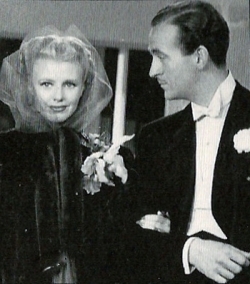 Charles Ruggles and Ann Harding are perfect in it, and Victor Moore always plays the best absent-minded characters. -Betsy Jenkins (Judy Garland) comes back to Carvel a grown up woman. All the women causes a lot of confusion and crazy Mickey Rooney moments. The Hardy’s are worried mom won’t be able to come home for Christmas, but in the end it all works out. Andy gets his date to the dance, Betsy sings and mom makes it home on Christmas Eve. To Review: It’s a really cute movie, and a chance to see Judy Garland treated like a young woman rather than a child. It’s also fun to see three of Andy’s love interests all in one movie. •Remember the Night (1940): A couple of years ago, Turner Classic Movies premiered this Preston Sturges film. With the release of the DVD last year, it’s gaining popularity, but still isn’t up to par with other Christmas classics. 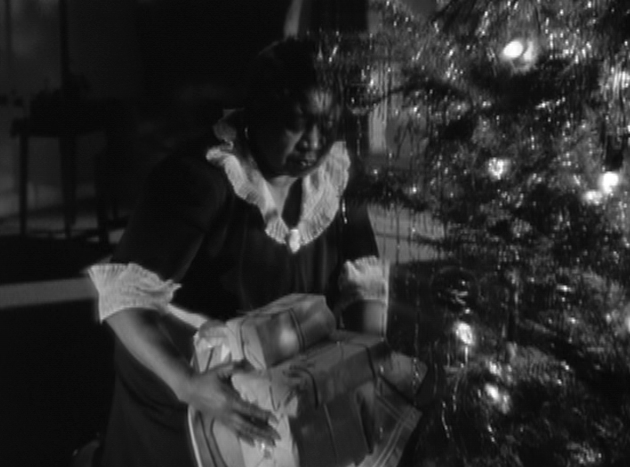 Lee Leander (Barbara Stanwyck) steals an expensive diamond bracelet and is on trial only a few days before Christmas. Prosecuting lawyer John Sargent (Fred MacMurray) postpones the trial until after Christmas, since it is hard to get a jury to convict someone as guilty before Christmas. John hates to see Lee spend Christmas in jail so offers to for her to stay with his mother (Beulah Bondi), aunt (Elizabeth Patterson) and farm hand (Sterling Holloway) in Indiana. To review: This is my favorite Christmas movie. The two old women together bickering is adorable, Fred MacMurray and Barbara Stanwyck have fantastic chemistry and Sterling Holloway offers a lot of comic relief. This is a World War II movie that takes place on the American home front. The film follows a year with the Hilton family: Ann (Claudette Colbert), Jane (Jennifer Jones) and Brig (Shirley Temple) as they struggle with their father away at war, rationing and taking in boarders. The whole movie isn’t a Christmas movie, only at the very end. The family has a Christmas party with friends and a few soldiers. They play games and try to forget that their father isn’t there to join in the fun and some loved ones were killed in the war. But in the end, they get the best Christmas present they could ever ask for. To review: This is sort of like “Meet Me in St. Louis”: The whole thing isn’t a Christmas movie, but can be considered a Christmas movie. It’s one of my all time favorite films. I think that it really shows the true Christmas spirit and what is imporant at Christmas: family. This entry was posted in Holidays and tagged ann harding, ann rutherford, bachelor mother, barbara stanwyck, betsy jenkins, beulah bondi, beyond christmas, beyond tomorrow, c. aubrey smith, charles ruggles, charles winninger, christmas movies, Claudette Colbert, cynthia potter, david niven, don defore, elizabeth patterson, fred macmurray, gail storm, ginger rogers, harry carry, holiday movies, it happened on 5th avenue, jean parker, jennifer jones, judy garland, Lana Turner, love finds andy hardy, mickey rooney, polly benedict, remember the night, richard carlson, Shirley Temple, since you went away, sterling holloway, victor moore by Jnpickens. Bookmark the permalink. I love so many of the movies you mentioned here, particularly Remember the Night, Bachelor Mother, Since You Went Away, and Love Finds Andy Hardy. I’ve only seen parts of It Happened on Fifth Avenue, but it looked really charming and I hope to catch the whole thing when it’s on again on Christmas Eve. I particularly enjoy in “Remember the Night” the bickering between Patterson and Bondi, like when they talk about the burned cookies hehe. “It Happened on Fifth Avenue” has been on alot this month so make sure you catch it! It’s a bit silly sometimes, but really cute. OK, I’ve tried to find the title to a movie that I enjoy, but I can’t find it. So, between you and your Mom, you’ll probably know the answer. There’s a Christmas movie about a single Mom who wants to get her son a train for Christmas. She has a boyfriend, but she becomes interested in a man she meets at the toy store. What’s it called? By the way, I LOVE Christmas in Connecticut. It’s called “Holiday Affair” with Janet Leigh and Robert Mitchum. We’veseen it a couple of time. It’s cuuute.